Holy cow you guys. I can't believe it's been two months since my last post! I apologize for the radio silence, I've been a traveling fool for the last month or so. This particular trip all started with a text message from my friend April, the owner of Boston General Store. " I have a crazy idea. Let's talk about it at brunch" she texted. Turns out the crazy idea was an invitation to join her on a super last minute trip to Joshua Tree for the Desert and Denim Tradeshow. After a little thought, I decided to spring for a ticket and join her on a weekend adventure in the desert. I'd never been to Joshua Tree, so how could I say no? There are many routes to choose from but we decided to fly from Boston into Ontario, California via Phoenix on American Airlines. This was Adam's recommendation and after weighing the cost of flying into other airports like Palm Springs, LAX and San Diego, we decided this fit our itinerary the best. The nice thing about flying into Ontario is you get the bypass all of that LA traffic. The Ontario airport was also super quiet and low-stress. Something to keep in mind if you're planning a trip yourself! The living room at our Airbnb. Sunrise from the back porch. Pro tip: take plenty of warm clothes. Layers are very appropriate for this climate. The temperatures varied wildly throughout the day and night. Also, the wind is no joke. Even in the 40's it can feel cold af with that high desert wind. I think I was in denial about how cold it could get coming from winter in Boston. I guess I assumed it's California, it must be warm. Not the case at all. Also, don't forget chapstick! The desert is soooo dry. The adorable Pioneertown Motel, where I wish we'd stayed. On Friday we spent the day at the Desert and Denim show in Pioneertown. The show took place at the adorable Pioneertown Motel (we're dying to stay there next time!). We walked around all of the booths and tables chatting with makers like: PF Candle Co., Juniper Ridge, Bradley Mountain and Etta and Billie. This is one of the shows where April does a lot of her shopping for her hip shop, Boston General Store. She's always on the hunt for great products that are unique and well made and this seemed to be where a lot of those west coast brands convened. We attended PF Candle Co's candle making workshop and got to learn first hand from the owners, Kristen Pumphrey and Thomas Neuberger, how their wildly popular soy candles are made. April and I both chose to pour a 'Black Fig' scented candle. If you come over to our house, you'll probably get to smell it in action! I have to say that the show was a lot of fun to attend as a non-trade person. We had some amazing tacos, vegan cashew cheese and drank some Oregon rosé out of a can. Those hipsters know how to throw a trade show! hahahaha. But really, it's true. We had a blast! April and I taking a wine break at the Desert and Denim show. La Copine in Yucca Valley - conveniently located down the road from our Airbnb, La Copine is a local favorite with a killer brunch. The food is super tasty and we loved the smoke + hash so much that we ordered it both times we ate there! Be prepared to wait for a table, especially on the weekend. Pro tip: show up, get on the list, grab a coffee and peruse the adorable Pioneertown General Store while you wait for a table. (the trailer in the parking lot) Or, go during the week when it's less busy. It's definitely a destination spot so plan at least one meal here if you're in the J Tree area. The Natural Sisters Cafe we got lunch here one day and loved it. There was also a very long wait but the organic, healthy salads, smoothies and juices are worth the wait. 29 Palms Inn Restaurant my cousin recommended this restaurant so we went. It was a super long drive from our place but more convenient if you're in 29 Palms or near that part of Joshua Tree National Park. The dining room at La Copine. Cutest General Store full of hand picked desert provisions. BKB Ceramics - April and I fought over their best ceramic pieces and bought as many as we could fit into our carryon's. Loooved this shop! Beautiful ceramics at BKB Ceramics. Finally, what I looked forward to the most, hiking in Joshua Tree. In a perfect world we would have spent more time in the park but this was a quick trip and the park is HUGE. We drove through a lot of the park and made quick stops at Jumbo Rocks, the Cholla Garden, and ended at White Tank for one last sunset. I can't wait to return. Watching the sunset at White Tank Campground. Until next time, Joshua Tree! Where are your favorite spots in the park? 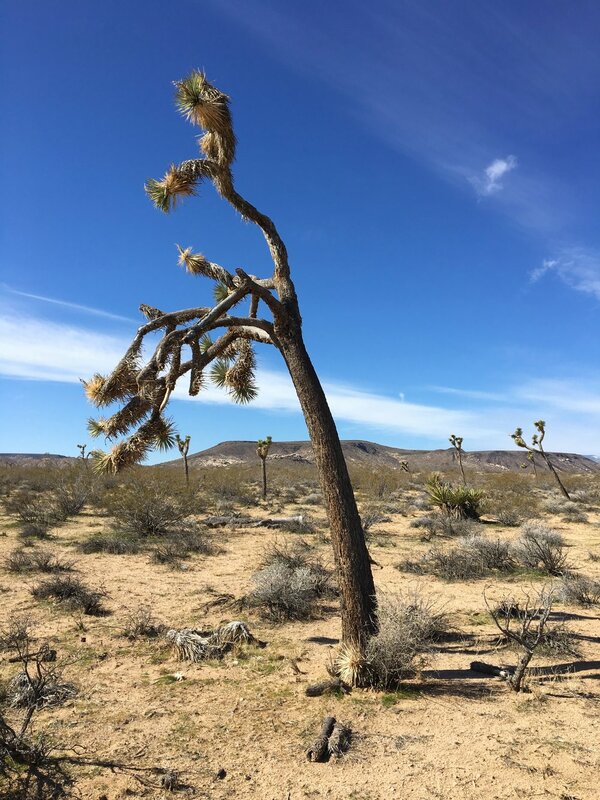 Have you been to Joshua Tree before?